My Other Life by Paul Theroux starts with a Peace Corps love affair in a Malawian leper colony, and follows the author from Singapore where he starts his family, to London, where he offers cunning insights on British culture, and finally ends in America. 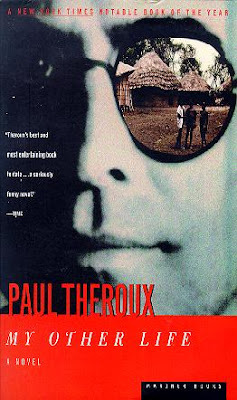 This book reads like an autobiography, and the character “Paul Theroux” definitely has a very similar life to that of the author, Paul Theroux. But this book isn't fact, it’s a fictionalized memoir. This stylistic choice gives Theroux the freedom to embellish or change events if he feels like it, essentially freeing him from the constraints of an actual autobiography. This is the story of a life I could have lived had things been different – an imaginary memoir. The fact that there are limits to serious travesty and that memory matters means that even an imagined life resembles the one that was lived; yet in this I was entirely driven by my alter ego’s murmur of ‘what if?’…The man is fiction, but the mask is real. In many ways it feels like My Other Life is a vehicle for Theroux to write about things he hasn’t developed into full stories or books (kind of how 2b1b does “Thought I couldn’t flesh out into full entries.”) Each chapter could stand alone, and Theroux ponders a huge range of subjects from “Sisterhood,” to “A Part in a Movie,” to “The Writer and His Reader,” etc. (his chapter titles are quite literal). Recurring themes are: Theroux is constantly about to be seduced by determined but unsuitable women from whom he retreats at the last moment; the fragile but oddly intimate relationship between writer and reader; and he bears an agonizing sense of exile from an everyday, quietly satisfying domestic existence he seems to cherish but can never attain (hence his compulsive travels). Two days? For three sentences??? Maybe someday I'll be that meticulous...but right now it takes me less than 30 minutes to write a blog post! My Other Life is a bit long, but totally enjoyable. Have you read it? Let me know what you thought! And if you haven't I recommend it - definitely worth the read! Read an interview with Theroux here.